Needle Radio Frequency is the latest in laser technology that combines the advantages of all other laser techniques and assists easy and streamlined procedure for skin tightening. Needle Radio Frequency is the ideal and paradigmatic technology used for skin tightening, skin lifting, acne scar removal and skin rejuvenation. The technology uses micro needles on the affected skin portion for the treatment. Needle RF is considered to be a minimally invasive anti ageing treatment. This method delivers radio waves through the use of fine needles also called as microneedles on the affected dermis. The needle used is adjusted between 0.5 to 3.5mm depending on the target area and the deepness of the needle is to be injected below the skin surface. Needle RF technology uses radio waves for tightening and rejuvenating the skin. The whole needle system emits radio frequency beams via microneedles leading to the heating of tissues below the skin surface. These tissues are recovered by the stimulation and production of collagen - the pigment responsible for skin glow and elasticity. The method had proved its efficacy with outstanding results keeping intact the safety of the patient. The method requires a shorter period of time resulting in decreased discomfort. 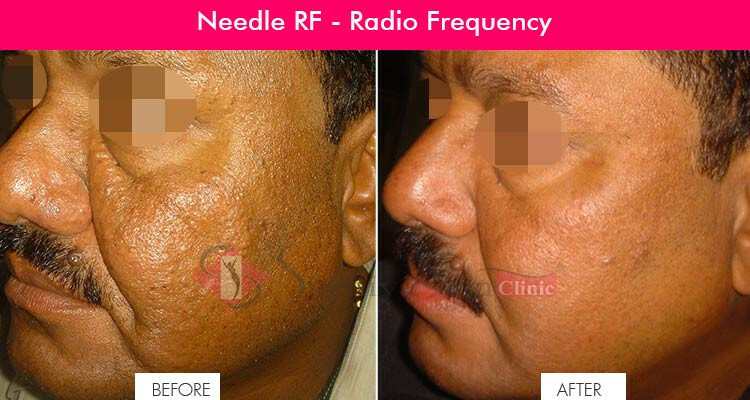 Needle Radio Frequency provides solution for numerous epidermis and dermis problems. It is a proven effective anti ageing treatment.Apart from this, it is also helpful in scar removal, wrinkle removal and skin rejuvenation. RF is a very potent tool and has shown dynamic success-driven results. As it directs strong radio waves in a close distance with the skin, it causes slight discomfort to the patient. However, the discomfort is gradually minimized with home care medications post the treatment. There are no side effects involved. Needle RF is considered as the most powerful anti-aging treatment. This technique also accounts for birthmark scar removal and improvement of the skin tone along with its tightening. It is also indicated for skin conditions like hyper pigmentation. Radio frequency is beneficial for conditions like wrinkles, fine lines and marks.